LiveChat - is an online chat solution that helps you connect with your customers on your website. When using LiveChat, you can see in real time the way visitors behave and approach them on each step of the buying process. This allows you to easily provide instant help and, in result, increase your conversion rates. 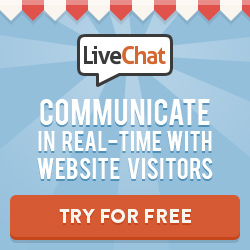 LiveChat is a cost-effective and feature-rich, scalable customer communication platform. It comes with a built-in ticketing system, offline messages, canned responses, customer message preview, exportable reports and SSL encryption. As a LiveChat Affiliate, you get a 20% in recurring commission for each payment a customer makes, for the lifetime of that customer. The cookies lifetime is 120 days. LogmeOnce - Every day, we access a lot of websites for personal or business use to perform daily activities. Personal (ex. Facebook, Gmail, Travelocity, AOL, Groupon, etc. ), or Professional (ex. Quickbooks, Salesforce, WebMail, Intranet, Timesheets). LogmeOnce Password Management, Identity Management (IdM) and Single Sign-On ( SSO) solutions provide you with a unique, personalized web page, and enables you to securely access all of your applications from a centralized management dashboard. This is one of many features available on logmeonce.com Become a Logmeonce Affiliate Partner and earn a 25% commission promoting the best password manager in the market. MacFly Pro - Easy-to-use utility with tools that keep your Mac clean, protected, and optimized. We are proud to announce that in Summer 2017 our team had successfully launched a brand new Mac software. We took the time to learn from competitors’ mistakes, eliminate drawbacks and perfect our product. The team has already put the product to the test across various marketing channels. Today, we are achieving yet another milestone and launching our own affiliate program. Earn $8.00 per sale. MAGIX & Xara Software - MAGIX offers private and professional users a technologically demanding and at the same time user-friendly range of products for designing, editing, presenting and archiving digital photos, graphics, websites, videos, and music. MAGIX is the international market leader in this field and has over 13 million customers! All MAGIX programs are fun to use and can be enjoyed without prior knowledge. The benefits of choosing MAGIX at a glance - 20% commission from the first sale - Receive monthly bonuses of up to £ 2,500 when you make ten or more sales in a month, commission and bonuses will be credited at the end of the month. Bonuses - 5 £ from 10 sales / month - 15 £ from 20 sales / month - 50 £ from 50 sales / month - 150 £ from 100 sales / month - 500 £ from 250 sales / month - 1,000 £ from 500 sales / month - 2,500 £ from 1000 sales / month. Malwarebytes - has just launched their new Anti-Malware Premium! This is an amazing new tool that proactively protects your home PCs against advanced criminal software which traditional anti-virus cannot detect. This new product also has updated malicious URL blocking technology and enhanced protection from unwanted programs such as aggressive adware and toolbars. Malwarebytes Anti-Malware Premium is available now for $24.95/yr. Malwarebytes products have a proven record of protecting computers by completely removing all forms of malware, including trojans, spyware, adware and rootkits. When it comes to the safety of your computer, Malwarebytes provides the ultimate in protection from the cutting edge of technology! Born out of community, trusted by millions, built to protect! Generous payouts: up to 30% commission for each sale. Maps Marker - allows you to pin, organize and share your favorite spots & tracks through your WordPress powered site easily. You can use maps from OpenStreetMap, Google Maps, Google Earth, Bing Maps or custom maps and additionally display your spots and tracks in innovative ways like through augmented-reality browsers. Earn up to 50% commission (pay per sale) on selling the premium WordPress plugin Leaflet Maps Marker Pro. We offer automatic performance awards and 3-tier-levels with 5% commission for each level. McAfeeStore.com - now part of Intel Security, is the world’s largest, dedicated, security technology company. One of the pioneers of antivirus protection, with 27 years of industry leadership and protecting over 125,000,000 customers worldwide! McAfeeStore.com is now pioneering complete cross-device security with our new 2016 products;- AntiVirus, AntiVirus Plus, Internet Security, Total Protection and LiveSafe. With more devices in more places, can consumers be sure you they always secure? McAfee is available on whatever they use, wherever they use it. A competitive payout of 25% (minimum) to all publishers. Available by simple download, making for strong conversion through a clear user journey. Thousands of consumers are downloading from McAfeeStore.com every day, you can be part of that success! Why you should join the program:- 25% minimum payout on all new purchases. Microsoft Store - Take advantage of this opportunity to be partners to offer the latest consumer products from Microsoft and participate on the success of the official Microsoft Store! All software products are available via electronic downloads – only at the official Microsoft Store. Next to a wide portfolio of hardware, Xbox products and games, software will also be offered via electronic download. Choose amongst 50 modern advertising banners and six product categories to present the right offer to your target group: Windows, Office, Entertainment (Xbox/Games), Hardware, Home & Money, Design & Developer. Your customers have numerous advantages on the official Microsoft Store, including: Latest lineup of software downloads, Convenient payment per credit/debit card, Highest security standards during order processing, Secure payment processing under certified Payment Card Industry Data, Security Standards (PCI DSS). Benefit as an affiliate partner from the attractive Microsoft Store commission rates: Sale of MS Software 15%, Sale of MS Hardware & XBOX & PC Games 7.5%, Sale of XBOX consoles 4.5%. Microsoft Windows Marketplace - is the site to go to to download the latest Microsoft Software including operating systems and the famous MS Office Suite of tools. Windows Marketplace makes it easy for you to discover the software & hardware that work best for you and your PC. Find the newest & most popular products on the market, download software on demand, compare product details, and read reviews from people just like you. More than 5,000 software downloads from over 2,000 companies. Commissions start at 5% and rise to 7.5% as your sales increase. MindZoom - Discover The Revolutionary Software That Will Reprogram Your MIND And BODY Automatically, Placing Thousands Of Positive Affirmations Directly In Your Brain, FAST AND EASY. Imagine Accomplishing Your Goals Right Now At The Touch Of a Button on Your PC. The key to increasing your Mental power, Abilities and Health are a step away. Effortlessly, comfortably in your home or work. The No. 1 Affirmation Software. Earn 50% commission per sale, that's $23.50 per sale. Monimaster Software - We provide publishers the opportunity to promote our Monimaster software. Join in our LinkConnector affiliate program for free and earn 60% commissions. All new affiliates are automatically approved; all you need to do is display a product's Buy Now Link on your web site or within your newsletters. Mortgage Magic Mortgage Reduction System - The Mortgage Magic System is a software product that helps homeowners cut up to 20 years off a typical mortgage, saving them hundreds of thousands of dollars. Our software is far superior to our competitors and is priced well below the market, so it is easy to sell and earn commissions. There is a huge market for our software, as it is a proven product that saves homeowners money while reducing their risk of long term debt. As a Silver Level affiliate, you'll earn $45.00 for each referral who purchases the Mortgage Magic™ System. Movavi Software - makes video editing and processing as simple as brewing coffee or using a blender. The products have been well-received and are attracting a large growing audience among digital camcorder owners and amateur digital moviemakers. Movavi Flash Converter - the ideal tool for downloading video from YouTube, Google and other popular video-sharing websites and converting Flash (.flv) videos to any format for any device Movavi Video Converter (former ConvertMovie) is a revolutionary new program for converting video & DVD files. Convert video. Rip DVDs. Save in iPod, iPhone, PSP, PDA, cellphone formats. Movavi VideoSuite gives you SIX amazing video tools in a single package. Edit. Convert. Split. Capture. Burn. Rip. Save to iPod. Movavi also provide tutorials such as How to convert video to MP4 format for Apple iPod, How to extract pictures (JPG, BMP, PNG, GIF) from a video file, and How to rip DVD to MP4 video format for iPhone and Sony PSP. Join Movavi Affiliate Program and get 40% commission on sales. NCH Software - offer a range of text and image links with an ongoing special of 10-50% off the normal pricing. At certain times of the year, we will also provide additional promotional material for special sales. Our applications include: WavePad Master Edition - Professional Audio Editing Software; Switch Plus - Audio File Format Converter; Prism Plus - Video File Format Converter; Golden Records - Vinyl to CD/MP3 Converter; MixPad - Multi Track Mixer; Express Burn Plus - DVD/CD/Blu-ray Burning; SoundTap - Streaming Audio Recorder; VRS - Multi Channel (1-64) Call/Radio Logger; IVM - 1-64 Line IVR and VoiceMail; Express Dictate - PC/Mac Dictation; VideoPad - Video Editing. NCH Software offers customers a full 14-day trial of all our licensed applications, so you may notice a gap from the time customers click thru to our website until a purchase is made. You now have the opportunity to earn a flat 30% commission from sales of our award winning and popular software range. With over 30 licensed applications and nearly 60 license classes to choose from, our program will ensure continued earnings for your website. The Neat Company - provides small business, sole proprietors and individual consultants with a suite of expense and spend management software tools designed to reduce the amount of paperwork, receipts and financial documents they must track and maintain manually. Earn 15% commission on sales and $2.00 per lead, which is when a referral starts a trial of the software. Nuance - is the leading provider of speech and imaging solutions for businesses and consumers around the world. Our technologies, applications and services make the user experience more compelling by transforming the way people interact with information and how they create, share and use documents. Now you can increase your online revenue by providing your visitors access to the leading supplier of Speech Recognition, Imaging, and PDF products and earn up to 25% commissions for each sale you refer to our online store. Products include familiar brands like Dragon Naturally Speaking, Paperport, PDF Convertor and OmniPage. Parallels - is a worldwide leader in virtualization and automation software that optimizes computing for consumers, businesses, and service providers across all major hardware, operating system, and virtualization platforms. Founded in 1999, Parallels is a fast-growing company with 900 employees in North America, Europe, and Asia. Its most popular software, Parallels Desktop for Mac, enables users to run Windows, Linux, and more on a single Intel-powered Mac without rebooting. The first non-Apple product ever to be named “Product of the Year” by MacWorld readers, Parallels Desktop was also recently awarded the #6 spot on PC World’s “Best 100 Products of 2007” list. Already deployed to over half a million users worldwide, Parallels’ popularity continues to grow as it revolutionizes the way the world works with computers. With the release of the highly anticipated Parallels Desktop 9 for Mac, there’s never been a better time to join the Parallels Affiliate Program! • Absolutely FREE to join! • 15% base commission! • Products range in price from $49.99 to $79.99! • Real-sales tracking report! • Promotions and Incentives offered! Parallels truly values its affiliate partners and provides full access to a wide range of creative materials with high conversion: • content • text and image links • banner ads • promotional offers Each Parallels Affiliate is considered a key member of our team. We provide the best support and assistance possible and each Parallels Affiliate can reach us anytime at parallelsaffiliate@cj.com. Please note that only Parallels Desktop for Mac or Parallels Workstation products are eligible for commission. For Total Sales Amount equal to or greater than 5000.00 USD increase commission to 20.00% per action. For Total Sales Amount equal to or greater than 10000.00 USD increase commission to 25.00% per action. PCVARK - Driver Tonic: Advanced Driver Updater Software to Update System Drivers. Experience an enhanced PC by updating all system drivers with Driver Tonic. The utility quickly finds outdated or missing drivers and updates them instantly in a single tap to give a smooth PC experience always. (To update outdated drivers, user need to purchase a license key.) We pay 100% of the sale amount to affiliates. Windows Tonic and Mac Tonic products: Driver Tonic Sale Plans - 1 year- $47.40 | 6 months- $35.70 | 3 months- $23.85 | 1 month- $9.95.